Oil Stadium for the Marching Madness Luncheon. Drum Corps International (DCI) has teamed up with organizations such as Music for All (MFA), the Indiana State School Music Association (ISSMA), and the Indianapolis Convention and Visitors Association (ICVA) to make Indianapolis a hotspot for the arts. "We have built a base of six powerful and influential organizations that can make a difference in our community," said Matt Carter, ICVA Vice President of music, arts and culture. Carter also serves as the executive director of the ICVA's MusicCrossroads initiative which with Drum Corps International has brought all of the city's arts organizations together including the International Violin Competition of Indianapolis, the American Pianists Association, Heartland Truly Moving Pictures, Music for All, and the Percussive Arts Society. MusicCrossroads has come to fruition in just the last couple years as a program of the ICVA in an effort to "advance quality of life through the attraction, support and collaboration of leading performing art entrepreneurs." On Wednesday, July 1, local leaders, including Indianapolis mayor Greg Ballard, joined the chief executives of the arts organizations for the "Marching Madness Luncheon" to lay a foundation for success in the city. More than 100 people in attendance heard from various speakers, including music educators and students, on the opportunities this partnership offers the city, its member organizations and thousands of music students. to mark his enthusiasm for marching music. 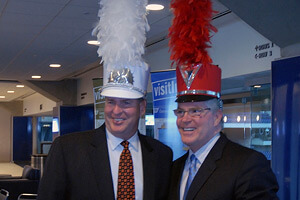 The luncheon was held at the brand new Lucas Oil Stadium, home to Drum Corps International's World Championships in addition to MFA's Bands of America Grand National Championships and the Indiana State Marching Band Championships. 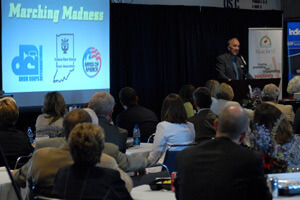 Each of these events brings millions of dollars and thousands of visitors to central Indiana every year. "We have been given a great privilege and opportunity to share our city with those leaders of tomorrow we see on the field," Indianapolis Mayor Greg Ballard said. Drum Corps International relocated its headquarters from the Chicago suburbs to Indianapolis in March of 2008. DCI Executive Director Dan Acheson, said that one of the reasons DCI was attracted to the city is because of this type of collaboration. "The arts are very strong here," he said. "This collaboration is interesting to us because we've never had the opportunity to be a part of an organization like this." As part of MusicCrossroads, DCI has utilized an Advance Resource Team (ART) to act as a local organizing committee of volunteers in the Indianapolis area. This team assists DCI staff in planning, organizing and executing initiatives and events, most notably DCI's week-long World Championships which this year will take place from Aug. 5-8 in downtown Indianapolis. with ICVA President Don Welsh. ART helps with everything from securing corps housing for the World Championships to promotion and staging of special events, Acheson said. The city of Indianapolis is well known for its self-proclaimed status as the world's amateur sports hub. A goal of the MusicCrossroads is to bring the arts to the city the same way it attracted sports organizations like the NCAA, USA Track and Field, and USA Gymnastics. "MusicCrossroads has helped guide us in the community," Acheson said. "It is this kind of collaboration that attracted us to make the move we did." 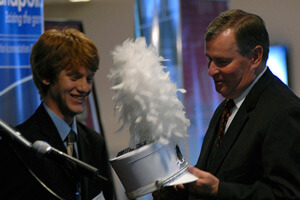 View a photo gallery from the Marching Madness Luncheon.